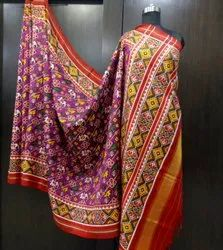 “Om Patola”, is a well-known manufacturer of a trendy and flawless assortment of single ikkat Patola Sarees, double ikkat patola saree, Ikat Silk Sarees, Silk Dupatta and Tanna Wanna Sarees. Integrated in the year 2015 at RAJKOT (Gujarat, India), we have developed a well functional infrastructural unit where we design this collection of apparels in large quantity. We are a Sole Proprietorship company which is actively committed to providing a high-quality range of apparels. Handled under the headship of our mentor “Mr. Ashish Makwana”, our firm has covered the foremost share in the national market.